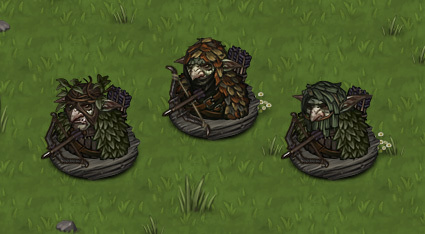 We’re excited to finally be able to reveal the newest addition to the world of Battle Brothers: The Goblins. They come with unique characters, skills, weapons and armor, and lore of their own. All of those things we’ll talk about today, so let’s get going! The actual update to the game will come together with an extensive changelog later this week! Goblins live in the lands beyond the reach of human civilization, in small states of their own, often encompassing only a single but heavily populated city. Although distant relatives to the Orcs, they don’t have much in common apart from their color of skin. Goblins have a complex social structure of different castes, the two most important of which are the lower caste and the political caste. The lower caste is the most populated by far, and members are born into servitude to their state or city, with very little rights other than to work for the benefit of the great Goblin state. They can be drafted into service at any time or otherwise assigned tasks with no say of their own. Although they make up the backbone of any Goblin state, they’re considered somewhat expendable, and their individual lives don’t matter all that much in the pursuit of power for members of the political caste. Unlike most humans, Goblins are not ruled by a single individual, but a council drawn from the political caste. The council decides on any action the Goblin state should or should not take and may mandate the drafting of Goblins from the lower caste led by a Goblin Overseer to perform any task, such as to attack rival Goblin states. Members of the council often change as individuals bribe, scheme or even assassinate to get rid of their rivals and attempt to secure more power for themselves. Although the council will proclaim that any action is for the betterment of the state, in reality, many decisions are the result political backstabbing, such as sending a rival council member to oversee an attack knowing full well that he’ll get killed along with all the other Goblins sent there. A political victory, sure, but also an example of Goblin states repeatedly weakening themselves. Goblins do not share a language with Orcs and otherwise have little in common, but they are nevertheless able to communicate with them on some level. To avoid roaming Orc tribes raiding their city states they often pay tribute until they’ve passed, and sometimes fight them if they seem weak enough in numbers. Orcs have also been used in political machinations and sent against rival Goblin states – which backfired more than once. Goblins consider roaming tribes of Orcs almost a force of nature outside of their other rivalries. They’re considered primitive, stupid even. They can be avoided at times, used at other times. But there is no stopping nature in the long run. From a game design perspective we wanted to introduce a faction that fighting against feels very different from our existing factions. Goblins have a heavy focus on ranged combat and lowering the effectiveness of Battle Brothers by applying various status effects. With their ranged weapons they often prefer a defensive tactic and let the player come to them to press the attack, challenging the very stationary approach that dominates many a player’s playstyle. Ultimately we want there to be no one superior tactic that is best against all enemies, but the need to always adjust your tactics based on the enemy you’re facing. This makes for a much more interesting and diverse combat experience in the long run, and Goblins are another step into this direction. In Battle Brothers, Goblins are physically weaker than humans and about the size of a large child. Due to their small size they’re unable to wear heavy armor or wield heavy weaponry, and they can’t take a lot of physical punishment before going down. They don’t have the most stamina and they’re also not the bravest, though the latter may be in part due to being essentially forced into arms. On the other hand, Goblins are dexterous little creatures. They use their small weapons with astounding accuracy to go for weak spots in their opponent’s armor, and because of their size and general skittishness are harder to hit reliably than many other opponents. Goblins are also quite cunning and intelligent, and to make up for their lack in physical strength rely on their wits, on ambushes and dirty tricks, on poison and superior numbers, to wear their opponents down. Because they’re at an inherent disadvantage in open battle, a lot of their tactics revolve around the use of ranged weapons, holding their opponents in place, and flanking them using their Wolfriders. Because Goblins are quite crafty and intelligent creatures, they have a whole arsenal of deadly tools available to them. Neither their armor nor weapons are particularly heavy, given the Goblins’ physical limitations, but they’re well made and balanced. Their equipment emphasizes their preference of mobility and ranged combat to wear down their opponents from afar. Their armor is made of leather as well as metal, and they wear mail and a variety of scale armor. 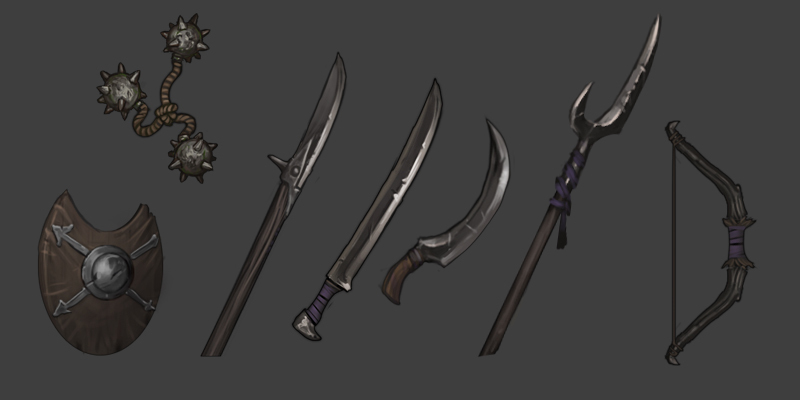 All of their weapons and tools can be looted and used by the player, although they aren’t the most damaging ones. Their armor can’t be looted as it would fit only children. A popular weapon with Goblin infantry is the ‘Spiked Bola’ – small iron balls with metal spikes bound together with rope, to be hurled at a target from a distance. Another specialized tool is the ‘Throwing Net’ – thrown at an opponent, it leaves them unable to move and lowers their ability to defend themselves, until they manage to cut it down. The ‘Jagged Pike’ can keep opponents at bay with its long range and tear terrible bleeding wounds. 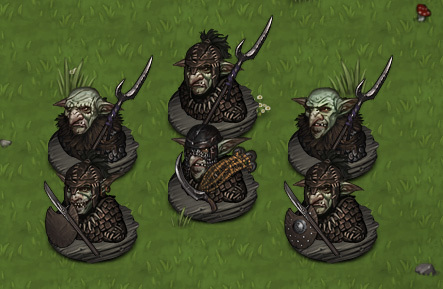 Goblin Skirmishers are the various types of melee infantry that Goblins employ. They are armed with a melee weapon of Goblin design – pikes, spears, falchions, long knives -, may carry a shield or throwing net, and often have spiked bolas as a secondary weapon to use from range should the opportunity present itself. They’re relatively poor at charging the enemy but quite competent in delaying an enemy charge and holding the line for Goblin Ambushers to pick the enemy off one by one. Goblin Ambushers are dedicated ranged troops armed with bows of goblin design and wear light camouflage armor that offers little protection but makes them hard to spot from a distance. Presumably because of their experience in fighting heavily armored Orcs, they’re trained to target weak spots in their opponent’s armor for increased direct damage. Their arrow tips are coated in poison which makes vision get blurry and moving in a coordinated fashion take a monumental effort. The effect of poison slowly diminishes with each turn after getting hit. 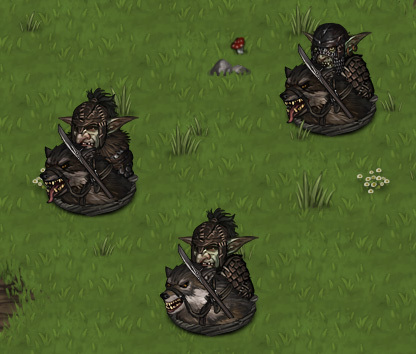 Goblins breed large wolves for war to use as mounts for their feared Wolfrider regiments. Wolfriders are faster than any infantry on the battlefield and can also move quickly through difficult terrain. This makes them them ideal to circle around a static battle line and attack archers and other lightly armed troops with from the rear, with the wolf supporting its rider by snapping its jaws at the enemy. Thanks to their swift mounts the Wolfriders are hard to pin in close combat and may break off attacks when the odds turn against them or a better target presents itself. On hitting a Wolfrider unit, either the rider or the wolf may be hit, and they may be killed independently from each other. Killing just the wolf may leave a Goblin Skirmisher to continue fighting on foot, while killing the rider will have you face a frenzied wolf no longer kept in check by its rider. Goblin Overseers are veterans and members of a higher caste mandated by a Goblin council to lead and oversee a regiment of Goblins in performing a task. They’re clearly recognizable as being in charge due to their ornate armor and helmet, and they carry long whips with which they can whip the common Goblin to perform better, and to get fleeing Goblins back into line. Because Goblins are drafted into service, the Overseer plays an important part in keeping everything together. Should he fall, Goblins are much more likely to fall into disarray, rout and flee the battlefield instead of soldiering on. Goblin Shamans are members of a small and secretive caste whose members seemingly possess otherworldly powers. Those powers are no less mysterious and inexplicable to the average Goblin than they are to a human witnessing them, and the nature of their power is a jealously guarded secret. In Goblin society, Shamans are often consulted as oracles, healers and experts on poison, and although not part of the political caste, hold tremendous power of influence. 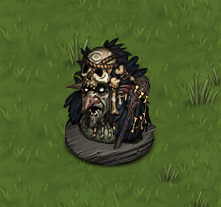 In battle, Goblin Shamans support their troops by commanding nature itself. They have been witnessed to make vile roots grow from the ground in an instant to hold people in place, and to send a swarm of a thousand black flies onto their opponents. Up personal, however, they are but frail old Goblins with no real weapon. Oh Yeah! I am really excited for this Update. Can not wait.I ant to fight some Goblins. You are doing really great work with this. Glad you like it. An encyclopedia that slowly gets filled as you progress through the game is something we’d really like to do – but we’ll have to see if we ultimately have the time, since there’s just so many cool things we want to add :) At the very least, the Goblins will be featured with their background and some more artwork in the digital lore book accompanying the game. The political angle strongly reminds me of the Drow in Forgotten Realms. Is that intentional? No, that’s not intentional. I, being the author of this bit of lore, have to admit not to be familiar with Drow politics. The wolfrider is good,I cant wait to fight against them. About the wolfriders – it sounds like there is a random chance to hit either the wolf or the rider and no way to aim for a specific target? Hits to the ‘head’ hit the rider, hits to the ‘body’ hit the wolf. Interesting,but quite controversial. According to tactics they should be nomading tribes of hunters/raiders & according to lore they’d rather use human wave. Will Goblins use human weapons? No, they are pretty crafty and make their own. Also, human weapons are too big and unwieldy for them to use. However, the player can use all the Goblin weapons. First of all, wow. I love the goblins, Especially that wolfrider, which brings me to my next thing. Maybe for mounts it could be something like the wolfrider, in the accessory slot, you could put a horse, which would mean you could use different tactics and that kind of stuff, like skirmishing on the horses. Idk just an idea. There was an 96mb update on BB today – quickly checked, nothing specific – man that was a let down. Great work guys, you are really making progress here. Can’t wait to try it out! Sorry for that, the update was just a direct x update. Real Update will come today!